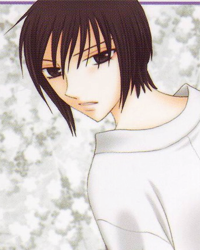 The young head of the Sohma clan is Akito Sohma, given such standing because Akito represents the God of the classic zodiac story, who once organized the banquet to which all the animals were invited. The story's main "antagonist" of sorts (Akito also comes with angst just like every other character in the series), Akito is a formidable presence in all the zodiac members' lives, especially for Yuki. If you didn't notice, I tried really hard to avoid using gender pronouns in the top paragraph, but now that we're out of the big size font I'm just going to come out and say it so I can stop referring to Akito as "Akito" all the time, because that's awkward writing - SPOILER ALERT Akito is female, raised as a man, so I will refer to her as female throughout this section even though most of the character cast isn't aware of this until the end of the series. That said, Akito's own traumatic past and dealings with her parents lead her to have a great fear of change and abandonment, especially when it comes to the members of the zodiac. This translates into an incredibly possessive, jealous, and paranoid nature, and this paralyzes her and prevents her from forming healthy relationships. Her relationship with Yuki is parasitic at best, as she purposefully withers his self-confidence to keep him with her forever. As the rat was the first animal to reach God's banquet, Akito especially prizes their connection over many of the others. "When I was very, very small ... my world consisted of Akito, my mother, and whatever scenery I could see beyond the sliding door. Those things ... and nothing else. Yuki was introduced very early on to Akito. His mother, concerned that his sickliness would negatively affect his relationship with Akito, was reassured that God and the rat always had a special bond, and that they would get along well. As part of the curse, upon first meeting her, he started to cry, just as all the others had upon their first encounters with Akito. "In the unknown depths of my heart, something cried out. I wanted to see him. I didn't want to see him. I wanted to hold him close ... and yet run away." And so it began. Akito would tell Yuki that as the rat, he was the greatest member of the zodiac, closest to God, so he was special just like her. In the beginning, it wasn't too bad, and they simply spent a great amount of time together, Yuki occasionally witnessing her grief from far away as she cried to Shigure. One day, however, Akito cracked, and started yelling at Yuki. Her world was black, and thus Yuki's was too. But Yuki was different from her - or else then Akito would be unneeded, would she not? She taunted him that his mother gave him to her, which was practically like getting abandoned. According to Akito, everyone hated the rat and no one cared about him, and if it weren't for her, he'd have nothing. Through this spiel, Yuki realized that he never spent time with any of the other zodiac members, and this kind of thinking became ingrained and she continually beat it into his brain. Everything about it was self-defeating; he wanted someone to help him, but as Akito said, he was afraid that no one would care, and he didn't want to risk suffering that kind of rejection. Yuki ~ Chapter 84 It was every day. He made me listen to those terrible words every day. His pitch-black words. Akito carved them into me. Before I knew it, they started to seem like the truth. Of course – why wouldn't they? Even if I reached out my hand ... even if I wanted to be saved ... I was afraid. I didn't want them to look at me with eyes of indifference or eyes of hate. I couldn't expect anyone to come for me. This all happens prior to the actual start of series. One of the first glimpses we get of Akito's poison is in the second chapter, where Yuki informs Tohru that her memory may need to be erased, depending on Akito's whim. Yuki remembers how Akito told him that "People turning into rats is definitely strange. If normal people found out, they will definitely be afraid and stay away! They'll leave you!" This turns out not to be the case for Tohru, who is more than happy to be his friend, even if her memory's erased. At this point in the story, however, Yuki's already tried to break free of Akito's hold, if even just a little bit - by deciding to enroll in a co-ed school, he's already defying her suggestion to go to an all-boy's school to further protect him from being found out. However, it's later revealed that Akito doesn't see this as much a threat to their bond because the curse still exists. One day after Yuki and Kyo skip out on the Sohma New Year's celebration, Akito stops by their school, and her appearance manages to thoroughly rattle Yuki. Displeased that he especially didn't attend, she taunts him by promising to lock him away in a dark room just as, we presume, she did to him when he was a child. Yuki seems to go into shock and is save by the timely intervention of Tohru, who can't bear to see him like that. Shigure ~ Chapter 20 For such a long time, locked in a dark room, suffering such severe psychological torture ... it truly isn't easy to forget, especially with such a deep scar on his heart! But Akito would never understand. Those who hurt others will also hurt themselves ... The pain between them will exist forever. A lot of courage is needed to forget the pain. I was going to write that Akito had the greatest effect on Yuki's life out of all the zodiac members, mentally torturing him, but upon further reflection, it's hard to raise such a comparison because she did different things to different members. Of course, there are some members that she didn't really touch much at all. Certainly, she kept Yuki the closest to her at a young and impressionable age, which was especially crippling for him, but as Yuki grew older, she pulled for Kureno to stay with her. She absolutely debilitated Yuki's self-esteem, but she did much the same to Kyo, forcing him to measure his self-worth as compared to Yuki. Regardless of who Akito did the most damage to, most all of the zodiac is aware of what she did to him. With the exception of Kyo, who is insensitive to Yuki's suffering, and simply calls him Akito's "boy toy" as if Akito weren't actually abusive. Akito ~ Chapter 54 Don't you dare even think about it. Did you know? This world is covered in darkness, and your life will also be filled with darkness. No hope at all, nor any possibilities. Your whole life is only a path of pitch black darkness. "Someday we'll be saved" ... what a joke! Don't even dare think about it! The Sohma's summer vacation is tinged with depression and melancholy. As we get this great tidbit of Akito's wisdom, Yuki reflects on his childhood experiences with Akito. She (or as Yuki thought, he) was always with him, and was forced to listen to her "cold, poisonous whispers." No one came to save him despite please to his parents (who simply wanted to use him to advance their standing within the family and didn't understand why he didn't want to be "Akito's favorite"), and he fell to depression, imagining the family he wanted but could never have. Akito conveniently comes to their vacation spot, and finds Yuki alone, and cheerily remarks how Yuki is always alone, thinking this an effective method to draw him back to her. Akito's obsession with the zodiac members is rooted in a deep fear of abandonment - she's convinced herself that it's best if the zodiac members stay together and that the outside world is too harsh and unloving. Akito ~ Chapter 59 There's not a moment when I'm not thinking of Yuki. I just reminded him that maybe it was about time he stopped lying to himself. He looked so shocked when I said that to him. I wonder if he's hiding somewhere and crying right now? That would really be like him! He really is an idiot! If that's how it's going to be, Yuki is better off coming back to me! He should be grateful that I still want him back since he's such a worthless human being! Despite this comment, we know that this simply isn't the truth. He has Tohru (and Kyo), and he's gotten more involved in his school activities. Even Shigure and Hatori know what's up - Shigure remarks that Yuki's changed, and Akito won't be able to lock him up as she did before. "So who really is the idiot that's been lying to themselves the most?" Late in the series, after Yuki's really gotten more involved in his student council activities and blossomed, he decides to go back to the main Sohma residence for New Year's. As expected, he spends the majority of his time by Akito's side. She's pleased that he decided to come, saying that she forgives him because he came back to her. In a bold move, Yuki parries this line, saying that he, too, forgives Akito, but then corrects himself by saying that he doesn't want to blame anyone. In a combination of internal monologue and actually spoken words, he manages to express his feelings to a stunned Akito. Yuki ~ Chapter 95 (I'm tired of making it Akito's fault. Or Mother's fault, or Kyo's fault, when things don't go the way I want.) I just ... I have a lot of bad qualities, and much of me needs changing. I have to keep aware of that. If I don't, I'll always be the fool. That's why. If I blame someone else, no matter how much time passes ... I won't be able to change. Akito's shocked and furious and confused at his words, and breaks a bottle over his head and demands he apologize to her. He does so, but realizes to himself that he's moved on and will never truly return to Akito. As Akito mopes bedridden after his outburst, in complete distress, Yuki is proud to report to Tohru how he started to break away from Akito's control. "I defied Akito. So he let me have it ... Inside, I was actually really afraid. But I pushed myself a little." You go Yuki coco. Though he can't erase what Akito did to him, he can become strong and move past it. On the other hand, Akito is so dependent on the curse that she clings like a leech to Yuki. She tells Kureno that she was very happy to meet Yuki, and as God, she could use him as an example to demonstrate the strength of the curse's bond between the zodiac members. Yuki ~ Chapter 131 I just separated from someone I have always been with. Though we were always together, it was always so painful together, such a burden ... and now that we have parted, this is my reaction. I'm being so unfair ... We will never meet [again]. I know it. In exchange, he has given me my "freedom." Based on the drawings, it would seem that this "he" refers to the rat spirit, but in a way, it also refers to Akito's unrelenting abuse throughout his youth. As Akito reveals her true gender to all the zodiac members and they come to terms with their uncursedness, they all know that their wounds will take time to heal. Yuki especially knows this, and has come to terms with what happened to him, has forgiven Akito, and simply works to better himself to overcome his emotional roadblocks. I was actually expecting this page to be much longer and was going to break it up into subsections, but really all there is to Yuki's relationship with Akito is her clinginess and the abuse Yuki had to put up with. While Akito was certainly very important in shaping Yuki's character, his story is much more how he rises above these difficulties thanks to the positive influence of people other than Akito.